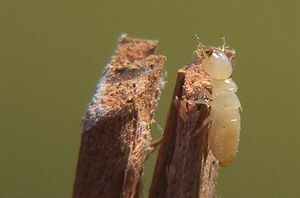 I looked under the porch of my house one day, shone a light in under there, and discovered that termites were tearing my house down and eating it! I asked them nicely to knock it off, but they ignored me. I sprayed them with water, and then cans of nasty aerosol stuff I had sitting around. It made sitting on the porch pretty unpleasant, but it didn’t faze those termites a bit. They didn’t even notice. They just kept on working in an organized way, with whole work teams (tiny little hard hats and lunch boxes…), harvesting my home! Once I knew they were down there, it seemed like, no matter what I was doing, I could hear them, chomping and chewing, destroying the place. That house wasn’t the nicest one in the neighborhood, but I was pretty attached to it and all. It didn’t take long before I’d had enough. It may have seemed unreasonable to the termites, but eventually they experienced my wrath. I called in the termite guy and he knew what to do. He had a special suit, some big drills and special squirtem stuff. He wasn’t fooling around. God’s anger is partly about trying to keep us safe (See: Why Does God Seem so Angry?). But there is another side to God’s wrath, the part where He zips up His hazmat suit, adjusts His goggles and becomes the “Termite Guy.” When God cannot get us to stop wrecking His garden, destroying His home, so to speak, eventually He puts a stop to it. He has been doing this in measured ways since the beginning – always with warnings, so folks have a chance to turn around. But eventually, He will clean house for good. You have to understand that final day is coming; it may seem unreasonable, but it’s not pretend. Jesus warned His disciples that God’s wrath would be terrifying (See: Matthew 24). But He offered a way out, for anyone who would believe in Him. This entry was posted in The Character of God and tagged Anger, God, Isaiah, love, Punishment, Termite, Vineyard, Wrath on June 17, 2013 by tombeaman.